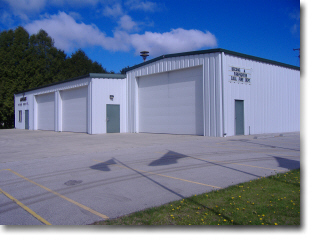 The Abrams Fire Department operates out of one station located at 5844 Oak Orchard Rd, and are dispatched through the Oconto County Sheriffs Department, located in the City of Oconto. 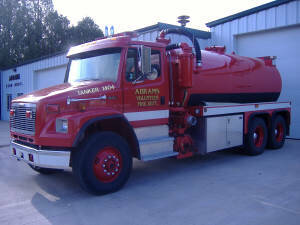 As stewards of the equipment provided by the generosity of the residents of Abrams, we take great pride in the appearance and condition of our apparatus and associated equipment. We go to great lengths to ensure our apparatus is always in a ready-to-roll condition to meet the emergency service needs of our community. 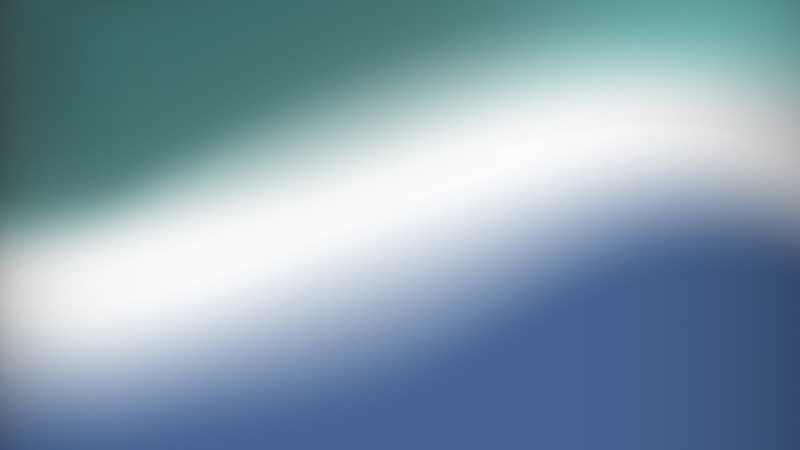 This page is designed to acquaint you with the apparatus we have available to fulfill our mission. Powered Ladder Rack, Thermal Imaging Camera, Hydraulic Generator, K-12 Cutting Saw, Chain Saw, Vehicle Stabilizing Equipment, 4 Telescopic Scene Lights, CAF (Compresed Air Foam) System, Portable Radios, Ice Water Rescue Gear, Wildland Firefighting Equipment, 4 SCBA’s And Refilling Station, Hose Beds, Electric Cord Reel. 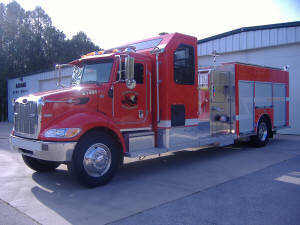 Primary response Engine for all structure fires and vehicle crashes. Positive Pressure Ventilation Fan, 2 Scene Lights, 4 SCBA’s, Extra Nozzles, Hose Beds, Deck Gun, Foam Hopper, 1″ Booster reel, Ladder Rack, Extra Hose Adapters. 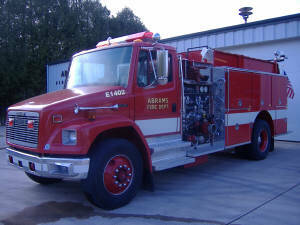 Secondary response Engine for all structure fires and vehicle crashes. 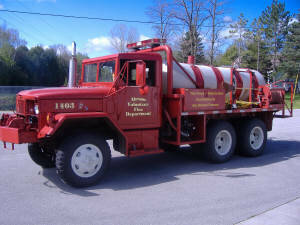 Primary response truck for all wildland and brush fires, also used to remove the other trucks from the mud. 3000 Gallon Portable Water Tank, Extra Foam For Both Engines, 1 Honda Generator With Scene Light, 70Ft. Of 6″ Hard Suction Hose, All Wheel Drive. 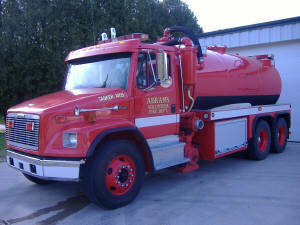 Hauls water from a fill site to the fire scene. 3000 Gallon Portable Water Tank, Extra Foam For Both Engines, 1 Honda Generator With Scene Light, 65Ft. Of 6″ Hard Suction Hose, All Wheel Drive. Pictures of the Jaws of Life. 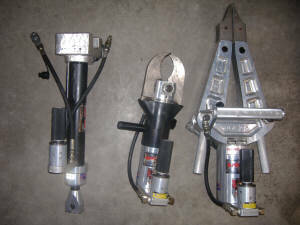 These tools are used to extricate victims who become trapped in either their car or even a building. As you can see below there are three tools that we use. 1. Hydraulic Ram: For pushing objects away from a victim. 2. Cutter: For Cutting doors, roofs, and metal objects trapping a victim. 3. Spreader: Also for pushing objects away from a victim. These tools are all ran by a Honda 5 HP gas motor! !